The LA Auto Show was the natural place for automakers to reveal their new green cars to the public for the first time. California is leading the charge for the new technology, with sizeable investments from municipalities, government agencies, and the companies building the cars. If a sustainable hydrogen economy is going to materialise in the US, it will be in California. That said, Toyota was alone in debuting a production-ready fuel cell car – the Mirai – after Honda made a late decision to delay the launch of its rival sedan. With the Mirai, Californians now have a choice of two hydrogen-fueled cars, the other being Hyundai modified Tucson. Deliveries, however, won’t start until the end of next year. Following in Toyota’s zero-emission footsteps was Volkswagen, which revealed a converted Golf. The ‘HyMotion‘ has a similar range to the Mirai, at just over 300 miles, but no plans for production have been announced. Volkswagen’s sister-brand Audi had a new take on hydrogen power, showing a plug-in hybrid A7 prototype that mated a battery-electric powertrain with fuel cells. The technology is perhaps the best compromise for travelling long distances without harmful emissions, as owners can charge up at their homes if a hydrogen station is inconvenient to reach. A new mild-hybrid concept also pointed towards a new A9 Hybrid sedan. What?! Maybe the only thing worse than having to leave your precious ride at an airport’s long-term parking is to come back and find it damaged. Door dings are one thing, but finding the wires of your car’s electrical system chewed by wild rabbits is another. U.S. auto sales maintained the strong upward trend that delivered a solid send-off to 2012, with most major manufacturers reporting double-digit gains for January. A number of manufacturers set new sales records during the first month of 2013, and Detroit makers, in particular, recovered some much-needed momentum. Two of the Detroit Big Three ended last year with market share declines. Industry observers credit a variety of factors for driving strong demand last month, including an improving economy and a bump in the long-struggling housing market. Notably, January saw demand surge in a variety of different segments, from high-mileage small cars and hybrid vehicles to full-size pickups. As Dan Akerson nears his two-year mark as General Motors CEO on Sept. 1, executive upheaval has emerged as a hallmark of his tenure. And more may be coming. The turnover — including last week’s ouster of marketing chief Joel Ewanick — has accelerated in Akerson’s second year, while GM’s U.S. market share slipped, losses in Europe widened and GM’s stock price languished. The management flux has created an air of uncertainty — and an undercurrent of fear, some insiders say — that impedes progress. Read the full news story here. The first primetime Daytona 500 in NASCAR history was a win for Fox — its highest-rated Monday night audience since Game 5 of the 2010 World Series — with 36.5 million viewers, up 22 percent from 30 million last year. 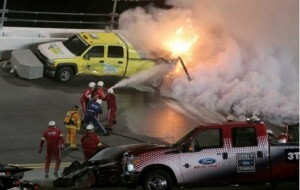 And NASCAR surprisingly continued its momentum from last season, partly because of the freak crash in which Juan Pablo Montoya’s car hit a truck loaded with jet fuel, injuring no one but scorching the track and forcing a two-hour delay. After last weeks reports that many cities that have banned texting and approved hands-free only use of cell phones have seen an increases in accidents, this was partially expected but likely will never pass. That’s what U.S. Transportation Secretary Ray LaHood is weighing, Bloomberg reports. LaHood thinks motorists are so distracted by their cell phones that bans on texting don’t go far enough. There are already restrictions in 30 states, but LaHood goes much farther. He even has Ford’s Sync in-car communications systems and General Motor’s OnStar in his sights. “Aggressive, top-notch facilities that understand the power of networking and education”. That is how the Locator Executive V.P Charis Lloyd describes what it takes to be listed in the top 25 most influential recyclers list for 2009. 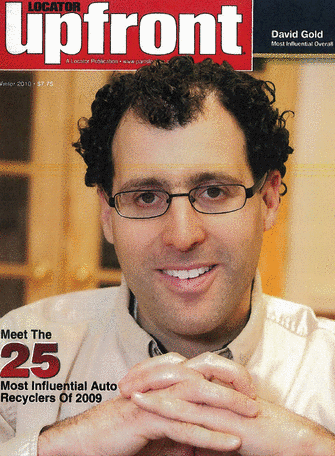 And our friend David Gold was voted number one, as the most influential auto recycler of 2009!